Property 7: Adorable Cottage just blocks to Windansea Beach-great value! Property 16: Beautiful Pacific Beach Bungalow. 5min Walk To The Ocean! !! !ONLY ON VRBO.COM!!! 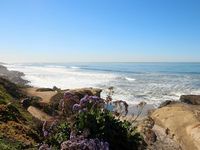 Property 19: Sir Bacon’s Royal Respite, San Diego, Near Main and Dog Beach, Pet-friendly! Property 25: Stunning Beach Cottage 2 Blocks from Ocean. Just Remodeled. Property 27: Beach Daze 2: Steps from dog beach, walk to shops and restaurants. Property 28: Steps to Beach w/ Amazing Views, Firepit, Hot Tub + Game Room! Property 29: Surf and Sun Cottage! Property 34: Ocean Beach Cottage - your perfect beach escape. Property 35: You Can Walk To The Beach! Property 37: Perfection! Beautiful fully remodeled cottage w/AC, view, and steps to the sand! Property 40: Beach Cottage just steps to Ocean with Deck + Shared Hot Tub! Property 42: Location, Location, Location...Quaint And Cozy And Close To All!! Property 43: Just steps to the ocean & bay, this luxurious home is better than a fine hotel! Property 45: Smith's Cottage By The Beach - your little slice of heaven near the beach.